This report details preliminary research conducted on human skeletal remains from Tikal, Guatemala. This pilot project aimed to evaluate the feasibility of developing a larger project on Tikal bioarchaeology. Human burials were excavated at Tikal by the University of Pennsylvania Tikal Project (PTP) during the 1960s and by the Guatemalan Proyecto Nacional Tikal (PNT) during the early 1980s. Each project recovered over 200 burials, thus, the series constitutes one of the largest burial series from a single Mayan site, and has considerable potential for understanding the history of ancient Maya health and nutrition. 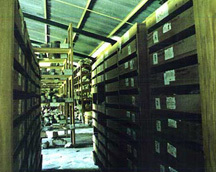 Some of the PTP remains are curated at Tikal in the Parque Nacional Tikal warehouse, and others have been at the University of Vermont with W. Haviland, but are soon to be repatriated to Guatemala. Approximately half of the PNT remains have been moved to the Museo Nacional in Guatemala City, while the remainder are housed at the site in the project lab. These are under the care of Licda. Vilma Fialko who expects to turn them all over to the Museum in the next year or so. The goals of this pilot project were twofold: to conduct a preliminary inventory of the remains housed in Guatemala, and to evaluate the feasibility of paleodietary reconstruction using stable isotopes. To this end, inventory work was conducted at the PNT lab at Tikal, the Park bodega at Tikal, and at the Museo Nacional. Bone and tooth samples were collected from the PNT remains at Tikal to examine bone preservation and the effects of consolidation on bone chemistry. These preliminary analyses allow an assessment of the potential for future pathological and isotopic research.